Participants in the latest convoy to deliver supplies to Hamas-controlled Gaza are lashing out at British MP George Galloway and his aides for "incompetence" and "increasingly bizarre and dangerous decisions" after the effort fell short of crossing into the Palestinian territory. Original plans called for the convoy to leave England in April and cross into Gaza from Egypt by May 15. That date marks the "Nakba," or the "catastrophe" of Israeli independence in 1948. Instead, the sixth Viva Palestina convoy never reached its destination. Egypt refused to let the convoy pass despite weeks of effort. It clearly caught Galloway off guard. He wrote that the Arab Spring power change in Egypt erased a ban on his entry into the country and he promised to lead the convoy as it crossed the border into Gaza to deliver "50 packed vans and lorries." Galloway, voted back into Parliament in March representing Bradford after being defeated in 2010, said his return to office "will be a boost to me in the fight for Gaza and Palestine and for all Arab and humanitarian issues. I will invest all the opportunities available to raise issues that we both believe in it." Representatives of several countries bailed on Viva Palestina's "Right of Return Convoy" even before it stalled in Jordan after Galloway refused to chart a course avoiding Syria, where government forces continue to massacre civilians rising against President Bashar al-Assad's regime. The New Zealand delegation unanimously withdrew, saying it didn't want Assad's regime "making political capital from any humanitarian mission to Gaza." But that's exactly what happened. Syrian officials, including military officials, feted the convoy. A governor of a major town greeted the convoy and an organizer wrote that the Syrian government "will provide us complete protection and security" while in the country. Galloway has long enjoyed warm relations with the Assad government, working closely with it on past convoys. Last summer, he told Hizballah's Al-Manar channel that Assad was drawing international criticism "because of the good things that he did such as supporting Palestinian and Lebanese resistance and rejecting to surrender to Israel." Galloway hailed Assad in a 2005 speech as "the last Arab ruler, and Syria is the last Arab country. It is the fortress of remaining dignity of the Arabs." "Syria," he said in a separate appearance that July, "is lucky to have Bashar Al-Assad as her president." Galloway and his Viva Palestina (VP) acolytes seem to be in agreement, however, that Gaza is lucky to have the terrorist group Hamas in control. From Galloway's infamous display of a bag of cash given to a Hamas minister in 2009 to his and VP's frequent meetings with Hamas leaders, the group works to enhance Hamas' place as "the elected government of Palestine." Galloway's refusal to avoid dealing with the unelected government of Syria prompted Turkish and Jordanian groups to distance themselves, too. "I don't understand the purpose of those criticisms," Galloway said. "We travel through all countries that lead to Palestine." "By going into Syria," a London-based supporter said, "they ARE taking sides" with the government. A state-run Syrian news agency quoted a convoy official demurring about the country's strife. "What is taking place in Syria is a Syrian affair," the unnamed official reportedly said, "and we are guests of the Syrian people and respect their right to determine their destiny without foreign interferences." The Syrian excursion may not have been the sole cause of Egypt's rejection. An analysis by the Meir Amit Intelligence and Terrorism Information Center pointed to violence that broke out between convoy participants and Egyptian officers during a January 2010 trip. "At that time they confronted the Egyptian security forces in a kind of rehearsal for the events aboard the Mavi Marmara a few months later." That led Egypt to declare Galloway unwelcome in the country, a move since rescinded after Hosni Mubarak's ouster last year. The Mavi Marmara was part of a Turkish-led flotilla which, deliberately aimed to confront Israel's embargo on shipments to the Hamas-controlled Gaza Strip. Nine people on the ship died in May 2010 after they attacked Israeli commandos with knives, clubs and other weapons as they soldiers tried to board. Though a United Nations report found that the embargo is legal and rooted in "a legitimate security measure in order to prevent weapons from entering Gaza stopping weapons from being smuggled," Galloway and flotilla organizers persist and provoke more confrontations. 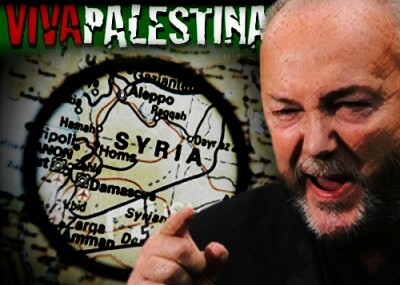 Galloway's mishandling of the itinerary doesn't mean supplies aren't flowing into Gaza. A similar effort dubbed "Miles of Smiles" was greeted Sunday by Hamas Prime Minister Ismail Haniyeh. "The arrival of the convoy is a new page of the Jihad against the occupation of the Palestinian territories," said the group's leader, Jordanian Sheikh Hammam Saeed, in an article published on the Hamas military wing's website. Saeed also heads the Jordanian branch of the Muslim Brotherhood. The Miles of Smiles convoy includes leaders from Interpal, a British organization designated by the U.S. Treasury Department in 2003 for supporting Hamas. Interpal is also a member of the Union of the Good, designated by the U.S. in 2008 for supporting and transferring funds to Hamas. The convoy's general director, Essam Yusuf, also known as Essam Mustafa, is the managing trustee and vice chairman of Interpal. The convoy also includes members of the New Zealand and Malaysian groups which broke off from Viva Palestina's latest convoy over the Syria issue. One participant described meeting Haniyeh for lunch, calling the Hamas leader "a seemingly humble man with a kind face that emanates sincere respect for whoever he is speaking with." Senior Hamas official Khalil al-Hayya welcomed the 13th Miles of Smiles convoy, presenting participants with a plaque showing "a shield surrounding Jerusalem, stressing that liberation has become closer than ever before." Efforts like this helps them "feel that the date for the liberation of Jerusalem is soon," al-Hayya said, "and when you come and express solidarity with us, we feel that we are not alone but the entire free world is helping us and standing with us." The convoy also met with Hamas hardliner Mahmoud al-Zahar, who told the group, "Today we begin a new cycle of civilization without injustice nor occupation nor colonization. The Arab revolutions today are the best proof to unity of peoples and their rallying around the choice of resistance and liberation. These convoys are only miles away from stepping towards the liberation of the man and Palestine from the filth of the occupation." Despite Galloway's failure, the episode further reinforces that his Viva Palestina operation and those like it are rooted in an ambition to prop up the Hamas regime in Gaza more than in a desire to help Palestinians. Since its inception in 2009, Viva Palestina has sought to elevate Hamas politically and financially and has delivered millions of dollars to the Hamas government. Similarly, the Miles of Smiles convoys have met with Hamas leaders during their trips to Gaza, beginning in 2009. Interpal has played a key role in dispatching the Miles of Smiles convoys, and in providing funds to Hamas' infrastructure. Earlier this month, the UK Charity Commission again cleared Interpal of any wrongdoing, despite the U.S. designation of the group. And the Commission cleared Viva Palestina for its support of Hamas in March 2010, despite the mounting evidence that Viva Palestina and Galloway delivered aid to the terrorist group.